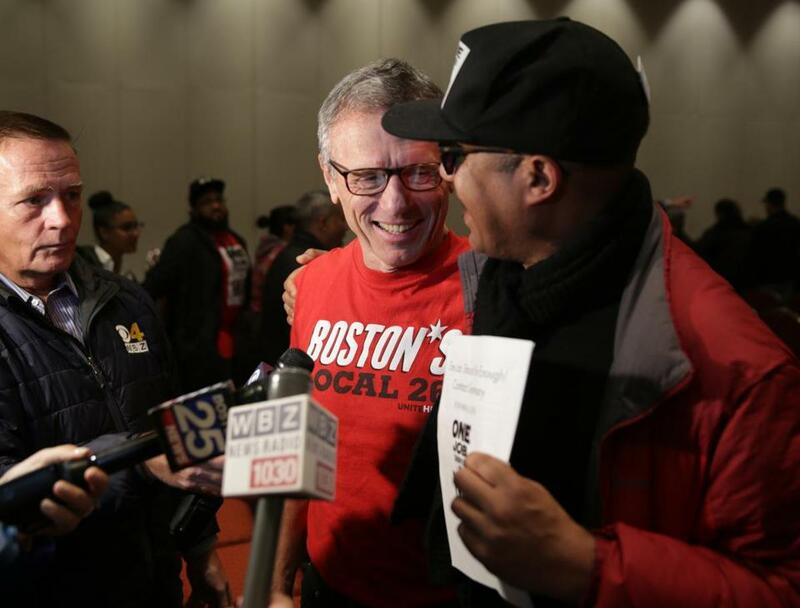 Brian Lang, left, president of Unite Here Local 26 in Boston, spoke at a news conference last month about the settlement of the strike against Marriott Hotels in Boston. But it’s the wide-ranging job protections that really stand out: a five-year job guarantee for immigrants if their protected status is revoked; 165-day advance notification of new technology and mandatory training for workers whose jobs will be affected by it; an alert system for housekeepers in case of an assault, as well as a registry of guests accused of sexual misconduct and possible banishment from the hotel. The far-reaching contract reflects the need for companies to keep employees happy in a tight job market, labor experts say, especially with workers increasingly standing up for their rights. And the high-profile nature of the agreement between the workers and Marriott, the largest hotel chain in the world, could invigorate the labor movement and influence public policy on pressing 21st-century workplace issues such as technology, sexual harassment, immigration, and retirement. “I think it will engender a lot of discussion not just at collective bargaining tables but in the halls of power in Washington, D.C.,” said Seth Harris, former deputy labor secretary in the Obama administration and a visiting scholar at Cornell University. The details of the contracts, which vary financially from city to city but include many of the same protections, came to light this week after workers in San Francisco became the final group of Unite Here union members to reach an agreement with Marriott. In all, 7,700 hotel workers were on strike simultaneously in eight cities — Boston, Detroit, San Jose, Oakland, San Diego, San Francisco, and two locations in Hawaii — the first time the hospitality workers’ union has conducted a multicity job action against one company. The 1,500 workers who walked off the job at seven hotels in Boston settled with the company last month after six weeks on strike. The contract will be used as a basis for the union’s negotiations with the rest of the unionized hotels in the Boston area. The Boston agreement also provides enhanced accommodations for pregnant workers, including reduced workloads and longer breaks; forbids schedules from being changed less than a week in advance; and reduces room quotas for housekeepers tasked with cleaning rooms that haven’t been serviced in several days as part of the “Green Choice” program that allows environmentally conscious guests to opt out of daily cleaning. Courtney Leonard, a 28-year-old cocktail server at the Westin Boston Waterfront, said the new contract will help her start a family and possibly move closer to Boston. Leonard, who grew up in South Boston, and her husband bought a house in New Bedford because they couldn’t afford to live closer, and some days she spends five hours in traffic getting to and from work. “One of the reasons I don’t have kids is I’m spending so much time in the car, and I’m petrified of not being able to provide the kind of life that I want to provide,” said Leonard, who has been working full time for the union since contract negotiations began. The raise, guaranteed hours, and maternity leave make the idea of having a family “a little less nerve-racking,” she said. Mei Leung, 71, a housekeeper at the Sheraton Boston Hotel for nearly 31 years, hopes to finally retire next year with help from the roughly $300 a month boost she’ll get to her pension. Mei, who is originally from Hong Kong and is a US citizen, is also grateful for the immigrant protections for her co-workers. Immigrants make up a large part of the hotel labor force, and the contract acknowledges how vulnerable that population can be. For those who lose their protected status — which President Trump has been pushing for — the agreement guarantees that if they regain their right to work, they can return to their job within five years. If they become citizens, they get a paid holiday. It’s less a political statement by the company, a big Republican donor, than a way to protect its workforce, said Harris, the former deputy labor secretary. And it’s especially noteworthy at a time when so many employers are using workers’ immigration status to exploit them, he said. In fact, Marriott’s citizenship holiday is “as patriotic a piece of collective bargaining as I have ever seen,” he said. The technology provisions in the contract are also a breakthrough and should be used as a model for workplaces across the country, said MIT management professor Thomas Kochan. Hotels could be hit by a number of high-tech advances, he said, such as machines that process room-service orders and reservations, robots that deliver linens, and artificial intelligence that adapts a room to fit the needs of its occupants, such as digital artwork that might appeal to a 3-year-old. The advance notification and training provisions in the Marriott contract assures that these systems will be introduced in a way that will “improve work rather than just replace workers,” he said. This isn’t to say that all the benefits in the Marriott contract could be easily replicated elsewhere, Kochan said. Marriott International has more than 6,700 hotels around the world and rakes in a net income of $1.37 billion last year. And the workers sacrificed greatly when they went on strike. But the agreements could energize the labor movement, including non-union workers who suddenly see the advantages. “Every time there’s a big win like this, organizers’ phones are ringing off the hook,” said Tom Juravich, a labor studies professor at the University of Massachusetts Amherst. For the workers in Boston who went without paychecks for six weeks, getting by on $300 to $400 a week from the union’s strike fund, the hard-won victory goes beyond better pay and benefits, said Brian Lang, president of Unite Here Local 26 in Boston. “It changes people’s expectations about what’s possible,” he said. Katie Johnston can be reached at katie.johnston@globe.com. Follow her on Twitter @ktkjohnston.